We were completely spoiled by our tour of the Alhambra with Daniele and wouldn't want to have any other guide. His seemingly infinite wealth of knowledge about the place, and especially his ability to literally read the palace walls, reciting the beautiful Arabic poetry, made it come alive. We appreciated his ability and willingness to talk about history in sophisticated and subtle terms. He was perceptive, noticing our interest in history, and responding accordingly. Generous, thoughtful, and witty. Daniele was fantastic! His enthusiasm for the history and beauty of La Alambra was amazing. He is incredibly knowledgable and speaks perfect english. I would highly recommend him. We enjoyed the tour. Great guide! A real insider. Danielle G was our guide. He was a true artist! He brought both drama and humor to the history of the palace. He was patent with our questions and had an infectious enthusiasm for the site. We snuck past crowds and saw everything we had hoped for. Great tour and great guide! Thanks a ton! Daniele was very knowledgeable, engaging and pleasant. Everything went very smoothly. Would highly recommend. Daniele is an incredible guide. Our afternoon with him gave us thorough insight to the past glories of Islamic Granada and the dazzling sensory splendors of the Alhambra. He helped us imagine what was there and no longer is, and with his command of Arabic helped us understand the embedded calligraphy of the endlessly decorated walls and ceilings of the palaces. He's smart with a sly sense of humor. For travelers who want a sophisticated tour with the details of history, he's the guy. Daniele is as good a guide as you'll get. Perfect English, but also speaks and reads Arabic which is so useful at this site. And he's very funny. Use him without any hesitation! Daniele has a very interesting history himself and clearly is an expert in the history of not only Granada but of Spain and particularly the impact that Moors had on Spain. He guided our group through little known (to outsiders) but very beautiful streets of Granada. I have visited Granada three other times, but this was the first time I had seen the historical streets that Daniele showed our group. I would highly recommend him for others tour groups. A mixed group of travellers were guided around the Alhambra by a man with in-depth knowledge of the site, Daniele brought to life the Palace and all the surrounding areas. Never looked at a guide book and answered all our questions with ease. He has an exceptional knowledge of his subject and a relaxed manner in which he delivered an informative and pleasurable tour. Thank you very much. I have no hesitation in recommending him to anyone visiting Granada and the Alhambra. Daniele may be the most passionate guide I have encountered in a long time. He loves his work and it shows. Along with his deep-dive knowledge of the Alhambra and it's history, Daniele speaks Arabic. He translates the verse etched on the walls of the Alhambra's magical edifices. I highly recommend Daniele for his factual l iwledge and his theatrical flair. Daniele is an expert on the Alhambra and world history . He is over qualified as a guide. He is fluent in many languages including Arabic . Daniele also reads and writes Arabic so was able to translate the script that is entwined into many of the building decorations . His commentary brought the Alhamba and the history of Andalusia to life. Best docent ever. Daniele is AWESOME. He is very knowledgeable and passionate about sharing his knowledge. We were a group of 9 with 5 being young adults from the ages of 14-27. These young adults thought Daniele did a fantastic job of bringing the history of AlHambra to life. 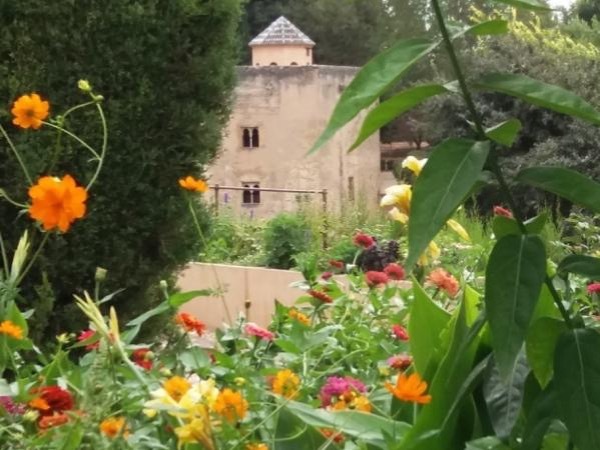 If you want to experience and learn about AlHambra I would have no hesitation in recommending Daniele. Daniele was informative, personable, eloquent, full of insight, and detailed understanding of the Alhambra and Generalife! He was creative in his storytelling and helped us imagine what life was really like there. He wanted us to have a great experience and we did. Highest regard. Daniele just gave the most amazing tour my family and I have ever been on. He is incredibly knowledgeable, with a deep understanding the history and intricate knowledge of Alhambra (having translated much of the writing gs on it to French). He took us back to the past, telling us the history in an often enjoyable and amusing way, where we were preparing to meet the Sultan. The presented a rich, rewarding, and peaceful journey through the rich tapestry that is Alhambra. Daniele was a fantastic guide. His knowledge was extensive & deep. He gave us an amazing background of the Alhambra & especially of the various religions that occupied the area . He was equally knowledgable about the art work & magnificent gardens. He has a passion for the area that shows in his presentation of the region. He got a wheelchair for my wife who has some mobility problems. Without his added efforts she would not have been able to do the tour. Daniele's obvious enthusiasm and knowledge throughout the tour, made the tour an absorbing and fascinating insight in to the culture and history of the site. His wonderful sense of humour made our tour a sheer pleasure! His intellectual knowledge (including fluent Arabic) allowed us to access The Alhambra in a way that would not otherwise have been possible. I have already recommended him several times, and will continue to do so. An absolutely first rate guide!!! Daniele is a superb tour guide with deep cultural and linguistic knowledge of the history of Granada. Highly recommended! Daniele was an amazing tour guide. He was so knowledgable about the site, it's history, the history of the area at the time and the founders. He was able to provide us with translations of the script throughout and give us a such unique perspective . We all walked away pleased with the experience and could find no fault with the tour. Daniele was a wonderful guide! His knowledge of both the Alhambra and Islamic architecture and art was amazing. We learnt so much! Daniele was the perfect guide. His knowledge of the Alhambra, and the history of Moorish Spain was significant. He provided us with an imaginative experience, helping us to understand the nuances of art, philosophy, architecture and mathematical aesthetic that form the foundations of the palace. It was a perfect walkthrough of a place I have wanted to visit for over 20 years. I can highly recommend Daniele as a guide. Danielle gave a tour that was one of the best I have had. His knowledge of history and excitement of the same is a great combination. He guided us as if we were in Medieval Spain approaching the Sultan at the Alhambra. He also has an interest and quite a bit of knowledge of the Jewish history. Would highly recommend this guide. I found him to be very responsible calling the night before to organize the times and places to meet. On top of that he texted and helped to organize our Jewish tour of Toledo. Danielle gave us a great tour of the Alhambra. Incredibly knowledgeable, interesting and passionate about the site. Great for history buffs but also good with our teens. Daniele made our tour of the Alhambra a trip into the past as he described how everything looked back in the day of the Sultans and their families. We could smell the flowers and visualize how the flower gardens must have looked. We especially appreciated that he could read the Arabic in the tiles . His knowledge of the Alhambra history was impressive which he shared freely. A great conversationalist he answered our questions as soon as they came to mind. He gets our highest rating. Daniele was very thorough in knowledge and pleasant to be with answering any questions we asked. He kept us moving at an nice pace with out rushing but made sure we saw as much as possible in the time we had available and managed avoiding the larger groups to give a more intimate experience. Daniele was also kind enough to recommend some restaurants and other sights in Granada that might be of interest. Through our tour with Daniele, we learned that the Alhambra was an architectural poem to the divine as well as to human accomplishments on earth. Daniele is an accomplished Islamist historian and linguist - and through his deep knowledge of the history and culture of the Islamic world, we were able to understand the sublime intricacies of the Alhambra - the science, the math, the artistry, the religious,and the poetry. We ended the tour with a far greater understanding of El Andalus from Daniele. Daniele is extremely knowledgeable, wonderful tour. Daniele was outstanding. The only problem we had was the driver did not speak very good English and since we were in the vehicle for 3 hours plus, would have loved key an English speaking driver to discuss the scenery. Scholar, expert, linguist, legend. These are some words that describe Daniele. He made our visit to The Alhambra much more enjoyable than it could have been without him. We had a multilingual group, so Daniele alternated between Arabic, English and Spanish throughout the tour. He also struck a good balance between engaging with us and explaining the site. My only advice to readers is to try to put together a larger group: the fee is the same, so split it between 10 people rather than 2 if you can. Wonderful guide! His experience showed and knowledge of history/ politics and religion as well. He made tours of Alhambra and general life interesting and engaged our teenage sons well. Continued with tour of major Granada sights of city center, many recommendations for food stops-- very pleasant voice/ manner. Would highly recommend this tour to others. Our tour of Alhambra and the Granada old city was fantastic. Our guide Daniele was an outstanding guide. He had a superior understanding of the history of the site and the city. He helped my three daughters imagine the splendor of the Alhambra by describing what it must have looked like from the eyes of a visiting Muslim aristocrat at the time. When he found out we were Jewish, he focused on the Jewish history of Granada during our tour of the old city. Definitely recommended. Daniele is very knowledgeable and a great guide! We had a lovely tour of Granada and an in-depth, interesting tour of the Alhambra! Phenomenal tour. Probably best ever anywhere. Learned so much and he was great w my two teenage daughters. Danielle was incredible! WOW WOW WOW- Daniele was the most fabulous guide.. his knowledge and PASSION for the Alhambra was evident as we went on a 13-14th Centuryhistory lesson and his translation of the Islamic writing made the walls truly come alive... can't recommend this Private tour highly enough.. nightlight of our trip so far... AMAZING. Daniel worked very hard to involve the 3 children on our tour. We very much appreciated his wealth of knowledge and patience to involve our group. He is an excellent guide and if you want to understand the history.........he can do it! We were delighted with our tour of the Alhambra palace with Daniele. He was helpful before the tour organizing tickets and arrived promptly at our hotel. His english is excellent and he set just the right tone for our tour. Obviously very knowledgable he did not burden us with facts and listened to our desire for a simple tour. He set a pace for my elderly mother and made sure she was able to see most of the sights. Well worth the expense. Daniele was fantastic! His knowledge of the Alhambra was exceeded only by his enthusiasm and love of the place. He tried and succeeded in bringing the Alhambra to life and giving you a feel for what it looked like and also what life was like when it was occupied. His knowledge of Arabic also enhanced the tour greatly. He kept the kids and teenagers engaged, as well. I can't recommend him enough. He was wonderful. Our visit to the Alhambra would not have been a fraction of the experience without Daniele's guidance! His fluency in English and Arabic, expertise and apparent love of Islamic art and architecture, and his animated delivery transported us through time and brought the Alhambra to life. He was fun and engaging with our 7 & 9 year old boys, yet at the same time incredibly detailed and informative. Thank you for making our time at the Alhambra so memorable! We thought he was great. Flexible with timing was very appreciated. Very passionate and a real historian. Easy to understand in English. We are a family of six in late 50's and 65+. While Daniele was an interesting guide, he was overpriced. We enjoyed the tour, but it was not exceptional;the price of the tour was almost double the cost of other guides we hired. We had hoped that Daniele would spend the entire time discussing with us the Islamic culture--art, poetry, language, since his bio indicates that this is his interest. Unfortunately he only spent about a quarter of the tour discussing these things. He devoted a fair amount of time to the standard historical overview. It was great to have an Arabic speaker who could tell us what the inscriptions meant in the palaces of the Alhambra. Daniele was a very knowledgable man with a love of the city he lived in. Recommended!!! Daniele's depth of knowledge made the Generalife and el Alhambra come alive for us. He kept a watchful eye out for large tour groups and made sure we weren't overtaken by them. He was also very responsive to our pre-booking questions about various logistics (purchasing tickets, where to get a bite to eat before our tour, etc). Danielle was an excellent guide and we would highly recommend him. What an amazing place and what interesting history! Our guide was so knowledgeable and enthusiastic. We fell under the spell of the Alhambra, and the hours flew by. We also wish to praise our driver and say how much we enjoyed seeing the Spanizh landscape. Daniel was a very knowledgeable and well read tour guide. A very pleasant and courteous gentlemen. We enjoyed our day tour with him. I recommend him highly. Wonderful, warm and charismatic, Daniele held my & my two teenagers attention for 3 hours with his knowledge of the Alhambra. I have travelled to many places in the world and I say without hesitation that Daniele is the best tour guide I have ever had. His knowledge is exceptional and his passion for the Alhambra transported us in time. We recommend him very highly. Daniel's tour of Granada was amazing. He is very knowledgeable about the history and culture of Granada. We appreciated the way he painted a picture of the historic events that occurred in the sites we visited. He is enthusiastic and engaging - we loved listening to him read the Arabic poetry o the walls of the Alhambra. We recommend his tour to anyone visiting Granada. Daniele was as fine a guide as I have ever experienced, and was worth every penny. He is amazingly accomplished, and I cannot think how our tour group of four people could have been better served. His ability to read Arabic and translate the many Arabic inscriptions made the tour exceptional. I give Daniele the highest possible rating. He made our visit very special indeed. Outstanding tour with Daniele who has a truly exceptional background enabling him to provide a level of insight that cannot probably not be matched any other guide to Grenada whether part of Tours by Local or some other organization. In addition to being knowledgeable, he is professional, considerate, and personable. His ability to read and translate the Arabic inscriptions in the Alhambra. I recommend him highly and unconditionally. Daniele is a wonderful, informed tour guide. Best of all he expresses a great love and respect for the Alhambra and its history. This was a truly wonderful day. Even prior to the tour he was helpful, advising us via email on how and when to get our tickets. As a wheelchair user I appreciated his taking us through the site in the easiest way possible. The driver was wonderful friendly and very helpful, even helping me in and out of the vehicle. Daniele was exceptional. After reading other reviews, we decided to book our tour with Daniele and were not disappointed. He was able to make the Alhambra come alive. His knowledge of the history and his ability to translate the Arabic enhanced our visit. For us, this way the perfect way to see and get an understanding of the Alhambra. The bboking of the tour was easy and the whole staff was easy to reach. You may pay less but the quality of a personal tour with Daniele will not be met. After a slight delay in starting our day. He was so patient with us and gave us a tour with such a personal touch. He was like a friend taking us around to show us his hometown! We had a private tour of Alhambra with Daniele and we had the most amazing experience.His knowledge of the Alhambra and his fluency in Arabic meant that he could translate for us the text on the walls of this beautiful palace.He was able to give us an interesting insight into the history and lifestyles of the Sultan and of this self sustaining city- all in perfect English..5/5 for this tour- highly recommend Daniele as a perfect guide..
Daniele is a great guide for the Alhambra. He's very knowledgeable of the history & pointed out details we would have missed if we had been on our own or with a large group tour. Daniele was a fantastic guide: on time, professional, polite and very knowledgeable. I would definitely recommend him! TOUR GUIDE RESPONSE: Thank you so much Daniela for your kind comments. It was a pleasure to be with you and the kids! Greetings! We took the Alhambra tour with Daniele and the only we regretted is not taking the entire Grenada Tour. Daniele was absolutely astounding with his warmth, knowledge, multilingualism and engagement with our 2 kids (14 and 11 years old). I visited Alhambra before and used the Audio Guide (NOT THE SAME!) . We were able to interact with Daniele and appreciate his deep dive into the city as well as the castle's history. We didn't wait in line and had better access. We absolutely recommend Daniele ...the BEST ! TOUR GUIDE RESPONSE: Dear Ziad, it was a pleasure to show the great achievements in architecture, mathematics, water engeneering of the civilization of al-Andalus to you and your kids. I hope you will remember your day in al-Hamra'. Thanks a lot. Daniele was a great guide. Excellent historian and scholar. We highly recommend him! TOUR GUIDE RESPONSE: Thank you so much! You know that Maria and your family are so much welcome here in Granada and Andalusia, for your next trip to explore this wonderful region. Daniele was an informative and excellent guide! He really made it possible to optimize our limited time in Granada and the Alhambra. Outstanding! Daniele is unusually well versed in history; speaks Arabic and can translate the poetry on the walls of the Alhambra; answered all of our questions. He brought the place alive for us. We recommend him highly. TOUR GUIDE RESPONSE: Wow. Thank you so much Ralph for your very kind comments. This is exactly what I try to do: to bring the monument alive. I'm very happy you appreciated. Thank you Ralph!!! Daniele is a fantastic, knowledgable and informed guide who showed us the Alhambra in a way that I never anticipated. First, Alhambra is amazing - see it in Granada. Then, couple someone with a love and knowledge of history and an intimate understanding of the ruins and it really comes to life. Go to Granada. See the Alhambra and Generalife - and ask Daniele to guide you. TOUR GUIDE RESPONSE: Thank you so much Jeff for your very kind comments! Warmest greetings to your family and come back soon to Andalusia! Thanks again. This Al-hambra tour was the highlight of our trip in Spain! We were very happy and pleased with the tour and especially with Daniele who immersed us into this cultural experience. Daniele was very pationate about Al-Hambra and highly knowledgable about the Arabic culture and Islamic art! In addition to being fluent in many languages including Arabic, he is also highly educated and knows his history very well. We were very lucky to have him as a tourist guide that day. TOUR GUIDE RESPONSE: Hi Ghada, real a pleasure to be with your husband and your enchanting children. Thanks!!! In a word our tour was simply "exceptional". Our tours with your company have always been very good but Daniele G. added an educational dimension in an entertaining manner that was far beyond our expectations! He has a wealth of knowledge on the history, the palace and the grounds which is quite impressive and his manner and delivery made it a fun and fascinating experience. His fluency in Arabic allowed him to actually translate words and poems inscribed in the wall. He is the BEST! TOUR GUIDE RESPONSE: Hi Patricia, thank you so much for your kind comments. It was a real pleasure to be with you and your friends! Cheers! TOUR GUIDE RESPONSE: Thank you so much dear Judy. It was really a pleasure to be with you and your enthusiast friends! In 5 hours we certainly could discover the essence of Granada, but you must come back: the city has so many other hidden treasures! Thanks again for everything and see you soon. Daniele was fantastic. He helped us to understand the history, art, politics--the tour brought Alhambra to life! Daniele was also funny. Do this tour with him!!! TOUR GUIDE RESPONSE: Thank you so much Katherine. It was really a pleasure to be with you in the marvelous Alhambra. Come back whenever you want, to visit more!! !